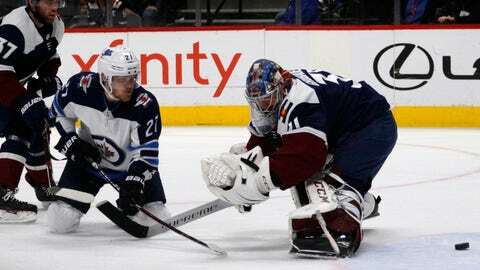 NOTES: Jets C Mathieu Perreault was hit in the face by the puck with 7:38 remaining. … Jets LW Brandon Tanev was sent home to have his hand examined. “We’ll get an assessment in the early part of next week as to the direction we’re going to go with it,” coach Paul Maurice told the media Thursday. … Avs F Mikko Rantanen missed a seventh straight game with an upper-body injury. He did some light skating Thursday morning. … Colorado finished the regular season 21-14-6 at Pepsi Center. … Barrie’s 59 points this season are the most by an Avs defenseman since Ray Bourque had 59 in ’00-01.